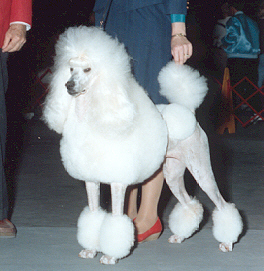 Madison was purchased from Jan Komaniak at Jateko Poodles in Coraopolis, PA in March of 1990. It was apparent that she was going to be the showgirl she was bred to be, princess and prissy. She excelled in movement and attitude. With the help of Kathy McAllister, she became our first Farleys D Champion. Madison passed away at home. We miss her.